This class keeps track of the SPI_SP_INPUT_ADDR config register, which tells the hardware which interpolation parameters to load. Definition at line 132 of file SIMachineFunctionInfo.h. Definition at line 29 of file SIMachineFunctionInfo.cpp. References llvm::CallingConv::AMDGPU_GS, llvm::CallingConv::AMDGPU_HS, llvm::CallingConv::AMDGPU_KERNEL, llvm::CallingConv::AMDGPU_PS, llvm::StringRef::consumeInteger(), llvm::ArgDescriptor::createRegister(), llvm::StringRef::empty(), F(), llvm::AMDGPUSubtarget::getAlignmentForImplicitArgPtr(), llvm::AMDGPUSubtarget::getFlatWorkGroupSizes(), llvm::MachineFunction::getFrameInfo(), llvm::MachineFunction::getFunction(), llvm::GCNSubtarget::getGeneration(), llvm::AMDGPU::getInitialPSInputAddr(), getMaxWavesPerEU(), llvm::MachineFunction::getSubtarget(), llvm::Attribute::getValueAsString(), llvm::AMDGPUSubtarget::getWavesPerEU(), llvm::AMDGPUSubtarget::GFX9, llvm::GCNSubtarget::hasFlatAddressSpace(), llvm::MachineFrameInfo::hasStackObjects(), llvm::AMDGPUSubtarget::isAmdHsaOrMesa(), llvm::AMDGPUMachineFunction::isEntryFunction(), llvm::GCNSubtarget::isMesaGfxShader(), limitOccupancy(), llvm::max(), llvm::AMDGPUMachineFunction::MaxKernArgAlign, llvm::AMDGPUFunctionArgInfo::PrivateSegmentBuffer, llvm::AMDGPUFunctionArgInfo::PrivateSegmentWaveByteOffset, llvm::CallingConv::SPIR_KERNEL, and llvm::ARM_MB::ST. Definition at line 202 of file SIMachineFunctionInfo.cpp. References llvm::ArgDescriptor::createRegister(), llvm::AMDGPUFunctionArgInfo::DispatchID, and llvm::ArgDescriptor::getRegister(). Referenced by allocateHSAUserSGPRs(), and llvm::AMDGPUCallLowering::lowerFormalArguments(). Definition at line 180 of file SIMachineFunctionInfo.cpp. References llvm::ArgDescriptor::createRegister(), llvm::AMDGPUFunctionArgInfo::DispatchPtr, and llvm::ArgDescriptor::getRegister(). Definition at line 209 of file SIMachineFunctionInfo.cpp. References llvm::ArgDescriptor::createRegister(), llvm::AMDGPUFunctionArgInfo::FlatScratchInit, and llvm::ArgDescriptor::getRegister(). Definition at line 216 of file SIMachineFunctionInfo.cpp. References llvm::ArgDescriptor::createRegister(), llvm::ArgDescriptor::getRegister(), and llvm::AMDGPUFunctionArgInfo::ImplicitBufferPtr. Definition at line 194 of file SIMachineFunctionInfo.cpp. References llvm::ArgDescriptor::createRegister(), llvm::ArgDescriptor::getRegister(), and llvm::AMDGPUFunctionArgInfo::KernargSegmentPtr. Definition at line 171 of file SIMachineFunctionInfo.cpp. References llvm::ArgDescriptor::createRegister(), llvm::ArgDescriptor::getRegister(), and llvm::AMDGPUFunctionArgInfo::PrivateSegmentBuffer. Definition at line 358 of file SIMachineFunctionInfo.h. References llvm::ArgDescriptor::createRegister(), llvm::ArgDescriptor::getRegister(), and llvm::AMDGPUFunctionArgInfo::PrivateSegmentWaveByteOffset. Definition at line 187 of file SIMachineFunctionInfo.cpp. References llvm::ArgDescriptor::createRegister(), llvm::ArgDescriptor::getRegister(), and llvm::AMDGPUFunctionArgInfo::QueuePtr. Definition at line 557 of file SIMachineFunctionInfo.h. Definition at line 561 of file SIMachineFunctionInfo.h. Definition at line 321 of file SIMachineFunctionInfo.h. References llvm::ArgDescriptor::createRegister(), llvm::ArgDescriptor::getRegister(), and llvm::AMDGPUFunctionArgInfo::WorkGroupIDX. Definition at line 327 of file SIMachineFunctionInfo.h. References llvm::ArgDescriptor::createRegister(), llvm::ArgDescriptor::getRegister(), and llvm::AMDGPUFunctionArgInfo::WorkGroupIDY. Definition at line 333 of file SIMachineFunctionInfo.h. References llvm::ArgDescriptor::createRegister(), llvm::ArgDescriptor::getRegister(), and llvm::AMDGPUFunctionArgInfo::WorkGroupIDZ. Definition at line 339 of file SIMachineFunctionInfo.h. References llvm::ArgDescriptor::createRegister(), llvm::ArgDescriptor::getRegister(), and llvm::AMDGPUFunctionArgInfo::WorkGroupInfo. Definition at line 233 of file SIMachineFunctionInfo.cpp. References assert(), llvm::MachineFrameInfo::CreateSpillStackObject(), llvm::MachineFunction::getFrameInfo(), llvm::MachineFrameInfo::getObjectSize(), llvm::MachineFunction::getRegInfo(), llvm::GCNSubtarget::getRegisterInfo(), llvm::MachineFunction::getSubtarget(), llvm::AMDGPUSubtarget::getWavefrontSize(), llvm::MachineFrameInfo::hasCalls(), I, isCalleeSavedReg(), llvm::AMDGPUMachineFunction::isEntryFunction(), MRI, Size, llvm::ARM_MB::ST, and TRI. Definition at line 454 of file SIMachineFunctionInfo.h. Definition at line 433 of file SIMachineFunctionInfo.h. Referenced by allocateSpecialInputSGPRs(), llvm::SITargetLowering::LowerFormalArguments(), and llvm::SITargetLowering::passSpecialInputs(). Definition at line 437 of file SIMachineFunctionInfo.h. 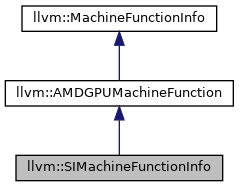 Definition at line 648 of file SIMachineFunctionInfo.h. Definition at line 303 of file SIMachineFunctionInfo.h. A pair of default/requested minimum/maximum flat work group sizes for this function. Definition at line 595 of file SIMachineFunctionInfo.h. Definition at line 485 of file SIMachineFunctionInfo.h. Referenced by llvm::SIRegisterInfo::eliminateFrameIndex(), llvm::SITargetLowering::EmitInstrWithCustomInserter(), llvm::SIFrameLowering::emitPrologue(), llvm::SITargetLowering::finalizeLowering(), llvm::SIRegisterInfo::getFrameRegister(), llvm::SIRegisterInfo::getReservedRegs(), isStackPtrRelative(), llvm::SIInstrInfo::loadRegFromStackSlot(), llvm::SITargetLowering::LowerCall(), llvm::SITargetLowering::LowerFormalArguments(), llvm::SIRegisterInfo::restoreSGPR(), llvm::SIRegisterInfo::spillSGPR(), and llvm::SIInstrInfo::storeRegToStackSlot(). Definition at line 450 of file SIMachineFunctionInfo.h. Definition at line 657 of file SIMachineFunctionInfo.h. Definition at line 513 of file SIMachineFunctionInfo.h. Definition at line 644 of file SIMachineFunctionInfo.h. Default/requested maximum flat work group size for this function. Definition at line 605 of file SIMachineFunctionInfo.h. Default/requested maximum number of waves per execution unit. Definition at line 621 of file SIMachineFunctionInfo.h. Referenced by limitOccupancy(), and SIMachineFunctionInfo(). Definition at line 670 of file SIMachineFunctionInfo.h. Referenced by llvm::GCNScheduleDAGMILive::schedule(), llvm::GCNIterativeScheduler::scheduleILP(), and llvm::GCNIterativeScheduler::scheduleLegacyMaxOccupancy(). Default/requested minimum flat work group size for this function. Definition at line 600 of file SIMachineFunctionInfo.h. Default/requested minimum number of waves per execution unit. Definition at line 616 of file SIMachineFunctionInfo.h. Definition at line 292 of file SIMachineFunctionInfo.h. Referenced by findUser(), getMad64_32(), getOModValue(), getSplatConstantFP(), isClampZeroToOne(), and llvm::SITargetLowering::isKnownNeverNaNForTargetNode(). Definition at line 462 of file SIMachineFunctionInfo.h. Referenced by getAllSGPRs(), and llvm::GCNSubtarget::getMaxNumSGPRs(). Definition at line 549 of file SIMachineFunctionInfo.h. Definition at line 553 of file SIMachineFunctionInfo.h. Definition at line 458 of file SIMachineFunctionInfo.h. Definition at line 666 of file SIMachineFunctionInfo.h. Referenced by llvm::GCNScheduleDAGMILive::schedule(), and llvm::GCNIterativeScheduler::scheduleMinReg(). Definition at line 446 of file SIMachineFunctionInfo.h. Referenced by llvm::SIInstrInfo::calculateLDSSpillAddress(), getAllSGPRs(), llvm::AMDGPUCallLowering::lowerReturn(), and reservePrivateMemoryRegs(). Definition at line 442 of file SIMachineFunctionInfo.h. Referenced by getConstant(), and llvm::SITargetLowering::isTypeDesirableForOp(). Definition at line 466 of file SIMachineFunctionInfo.h. Definition at line 565 of file SIMachineFunctionInfo.h. Referenced by getRsrcReg(), and llvm::SITargetLowering::LowerFormalArguments(). Definition at line 569 of file SIMachineFunctionInfo.h. Definition at line 509 of file SIMachineFunctionInfo.h. Returns the physical register reserved for use as the resource descriptor for scratch accesses. Definition at line 472 of file SIMachineFunctionInfo.h. Referenced by llvm::SITargetLowering::finalizeLowering(), getAllSGPRs(), llvm::SIRegisterInfo::getReservedRegs(), isStackPtrRelative(), llvm::SIInstrInfo::loadRegFromStackSlot(), llvm::SITargetLowering::LowerCall(), llvm::SITargetLowering::LowerFormalArguments(), llvm::SIRegisterInfo::restoreSGPR(), llvm::SIRegisterInfo::spillSGPR(), and llvm::SIInstrInfo::storeRegToStackSlot(). Definition at line 481 of file SIMachineFunctionInfo.h. Referenced by llvm::SIRegisterInfo::eliminateFrameIndex(), llvm::SITargetLowering::finalizeLowering(), getAllSGPRs(), llvm::SIRegisterInfo::getReservedRegs(), isStackPtrRelative(), llvm::SITargetLowering::LowerCall(), llvm::SITargetLowering::LowerFormalArguments(), and llvm::SIRegisterInfo::spillSGPR(). Definition at line 288 of file SIMachineFunctionInfo.h. Referenced by llvm::SIFrameLowering::emitEpilogue(), and llvm::SIFrameLowering::emitPrologue(). Definition at line 282 of file SIMachineFunctionInfo.h. References llvm::DenseMapBase< DenseMap< KeyT, ValueT, KeyInfoT, BucketT >, KeyT, ValueT, KeyInfoT, BucketT >::end(), llvm::DenseMapBase< DenseMap< KeyT, ValueT, KeyInfoT, BucketT >, KeyT, ValueT, KeyInfoT, BucketT >::find(), I, and llvm::makeArrayRef(). Definition at line 498 of file SIMachineFunctionInfo.h. Referenced by llvm::SIFrameLowering::determineCalleeSaves(), llvm::SIFrameLowering::eliminateCallFramePseudoInstr(), llvm::SIFrameLowering::emitEpilogue(), llvm::SITargetLowering::EmitInstrWithCustomInserter(), llvm::SIFrameLowering::emitPrologue(), llvm::SITargetLowering::finalizeLowering(), getAllSGPRs(), llvm::SIRegisterInfo::getReservedRegs(), isStackPtrRelative(), and llvm::SIRegisterInfo::spillSGPR(). Definition at line 300 of file SIMachineFunctionInfo.h. A pair of default/requested minimum/maximum number of waves per execution unit. Definition at line 611 of file SIMachineFunctionInfo.h. Referenced by llvm::GCNSubtarget::getMaxNumSGPRs(), and llvm::GCNSubtarget::getMaxNumVGPRs(). SGPR used for Dim's work group ID. Definition at line 626 of file SIMachineFunctionInfo.h. References assert(), llvm::ArgDescriptor::getRegister(), llvm_unreachable, llvm::AMDGPUFunctionArgInfo::WorkGroupIDX, llvm::AMDGPUFunctionArgInfo::WorkGroupIDY, and llvm::AMDGPUFunctionArgInfo::WorkGroupIDZ. VGPR used for Dim' work item ID. Definition at line 305 of file SIMachineFunctionInfo.cpp. References assert(), hasWorkItemIDX(), hasWorkItemIDY(), hasWorkItemIDZ(), and llvm_unreachable. Definition at line 299 of file SIMachineFunctionInfo.h. Definition at line 385 of file SIMachineFunctionInfo.h. Referenced by allocateHSAUserSGPRs(), allocateSpecialInputSGPRs(), llvm::AMDGPUAsmPrinter::doFinalization(), and llvm::AMDGPUCallLowering::lowerFormalArguments(). Definition at line 373 of file SIMachineFunctionInfo.h. Referenced by allocateHSAUserSGPRs(), allocateSpecialInputSGPRs(), llvm::AMDGPUAsmPrinter::doFinalization(), llvm::AMDGPUCallLowering::lowerFormalArguments(), and llvm::SITargetLowering::LowerFormalArguments(). Definition at line 389 of file SIMachineFunctionInfo.h. Referenced by allocateHSAUserSGPRs(), llvm::AMDGPUAsmPrinter::doFinalization(), getFPTernOp(), getLoadExtOrTrunc(), llvm::GCNSubtarget::getReservedNumSGPRs(), hasAnyNonFlatUseOfReg(), llvm::AMDGPUCallLowering::lowerFormalArguments(), and llvm::SITargetLowering::LowerFormalArguments(). Definition at line 425 of file SIMachineFunctionInfo.h. Definition at line 429 of file SIMachineFunctionInfo.h. Referenced by allocateHSAUserSGPRs(), and llvm::SIFrameLowering::emitEntryFunctionPrologue(). Definition at line 381 of file SIMachineFunctionInfo.h. Definition at line 533 of file SIMachineFunctionInfo.h. Definition at line 369 of file SIMachineFunctionInfo.h. Referenced by allocateHSAUserSGPRs(), llvm::AMDGPUAsmPrinter::doFinalization(), and llvm::AMDGPUCallLowering::lowerFormalArguments(). Definition at line 409 of file SIMachineFunctionInfo.h. Definition at line 377 of file SIMachineFunctionInfo.h. Definition at line 517 of file SIMachineFunctionInfo.h. Definition at line 525 of file SIMachineFunctionInfo.h. Definition at line 393 of file SIMachineFunctionInfo.h. Referenced by allocateSpecialInputSGPRs(), allocateSystemSGPRs(), and llvm::SITargetLowering::LowerFormalArguments(). Definition at line 397 of file SIMachineFunctionInfo.h. Definition at line 401 of file SIMachineFunctionInfo.h. Definition at line 405 of file SIMachineFunctionInfo.h. Referenced by allocateSystemSGPRs(), and llvm::SITargetLowering::LowerFormalArguments(). Definition at line 413 of file SIMachineFunctionInfo.h. Referenced by allocateSpecialEntryInputVGPRs(), allocateSpecialInputVGPRs(), getWorkItemIDVGPR(), and llvm::SITargetLowering::LowerFormalArguments(). Definition at line 417 of file SIMachineFunctionInfo.h. Definition at line 421 of file SIMachineFunctionInfo.h. Definition at line 683 of file SIMachineFunctionInfo.h. Definition at line 358 of file SIMachineFunctionInfo.cpp. References llvm::yaml::SIMachineFunctionInfo::ExplicitKernArgSize, llvm::yaml::SIMachineFunctionInfo::IsEntryFunction, llvm::yaml::SIMachineFunctionInfo::LDSSize, llvm::yaml::SIMachineFunctionInfo::MaxKernArgAlign, llvm::yaml::SIMachineFunctionInfo::MemoryBound, llvm::yaml::SIMachineFunctionInfo::NoSignedZerosFPMath, and llvm::yaml::SIMachineFunctionInfo::WaveLimiter. Definition at line 573 of file SIMachineFunctionInfo.h. Referenced by llvm::AMDGPUCallLowering::lowerFormalArguments(), llvm::SITargetLowering::LowerFormalArguments(), and processShaderInputArgs(). Definition at line 541 of file SIMachineFunctionInfo.h. Referenced by llvm::SIFrameLowering::emitEpilogue(), and hasAnyNonFlatUseOfReg(). Definition at line 164 of file SIMachineFunctionInfo.cpp. References llvm::MachineFunction::getFunction(), llvm::AMDGPUMachineFunction::getLDSSize(), getMaxWavesPerEU(), llvm::AMDGPUSubtarget::getOccupancyWithLocalMemSize(), llvm::MachineFunction::getSubtarget(), and llvm::ARM_MB::ST.
Referenced by llvm::SITargetLowering::finalizeLowering(), llvm::GCNScheduleDAGMILive::schedule(), and SIMachineFunctionInfo(). Definition at line 678 of file SIMachineFunctionInfo.h. Definition at line 577 of file SIMachineFunctionInfo.h. Definition at line 581 of file SIMachineFunctionInfo.h. Definition at line 293 of file SIMachineFunctionInfo.cpp. References llvm::MachineFrameInfo::getObjectIndexBegin(), llvm::MachineFrameInfo::getObjectIndexEnd(), llvm::MachineFrameInfo::RemoveStackObject(), and llvm::MachineFrameInfo::setStackID(). Definition at line 265 of file SIMachineFunctionInfo.h. Definition at line 585 of file SIMachineFunctionInfo.h. Referenced by llvm::SIInstrInfo::insertReturn(), and llvm::SITargetLowering::LowerReturn(). Definition at line 307 of file SIMachineFunctionInfo.h. Definition at line 537 of file SIMachineFunctionInfo.h. Definition at line 521 of file SIMachineFunctionInfo.h. Referenced by llvm::SIInstrInfo::loadRegFromStackSlot(), and llvm::SIInstrInfo::storeRegToStackSlot(). Definition at line 529 of file SIMachineFunctionInfo.h. Definition at line 589 of file SIMachineFunctionInfo.h. Referenced by llvm::AMDGPUCallLowering::lowerReturn(), and llvm::SITargetLowering::LowerReturn(). Definition at line 545 of file SIMachineFunctionInfo.h. Definition at line 365 of file SIMachineFunctionInfo.h. Definition at line 476 of file SIMachineFunctionInfo.h. Referenced by getAllSGPRs(), and reservePrivateMemoryRegs(). Definition at line 502 of file SIMachineFunctionInfo.h. Definition at line 489 of file SIMachineFunctionInfo.h. Definition at line 301 of file SIMachineFunctionInfo.h. Definition at line 346 of file SIMachineFunctionInfo.h. Referenced by allocateSpecialEntryInputVGPRs(), and allocateSpecialInputVGPRs(). Definition at line 350 of file SIMachineFunctionInfo.h. Definition at line 354 of file SIMachineFunctionInfo.h. Definition at line 133 of file SIMachineFunctionInfo.h. Definition at line 263 of file SIMachineFunctionInfo.h.